There is always something wonderful about waking up to a city that has just had a few centimeters of fresh snow. 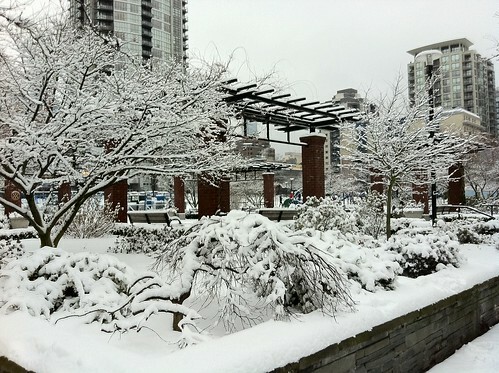 Fresh snow always seems to make people happier and the city always looks amazing. We here in Vancouver don’t get many of those days as the rest of Canada. For us, we have to usually travel up to the mountains if we want to get our taste of the “white stuff”. 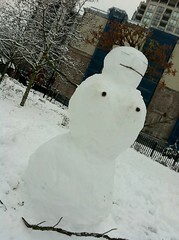 So when it snows in the city, people genuinely seem to be in better spirits. People seem to be friendlier and for me, the city starts to feel like a small town. I’m not sure if it is due to all of us, for this brief moment in time, share something in common. Granted I’m not so sure how the drivers are feeling right about now :). Junior just loves to play in the snow. He would rather be out there hearing the crunching of the snow on my feet and waiting for me to toss a snowball than actually doing his “business”. Sadly I know the snow will soon turn in to slush, but as long as it’s out there I’ll try to at least enjoy it.